OK, so my memory is so far gone now that if I do not write it down I forget it. I put together a packet for a trick and now I cannot remember the effect it was for. I am thinking it might be John Bannon, Bill Malone or maybe Darwin Ortiz. I have four queens, each with a different back. There is a blue bike and a red bike back and I have a double backer that matches those two backs. The picture might help it make sense, you can see that the double backer matches two of the queens. If anyone has any thoughts on this, I would appreciate it. I know I will recognize it when I see or hear the name. Thanks guys! 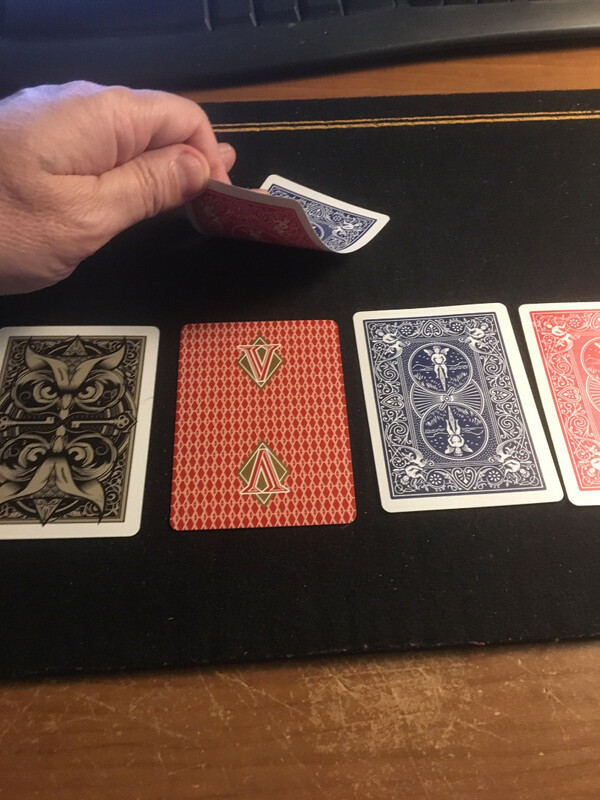 Great trick (along with Nick Trost's "Trick-Kards" my favourite packet-trick, so much magic with a few cards). 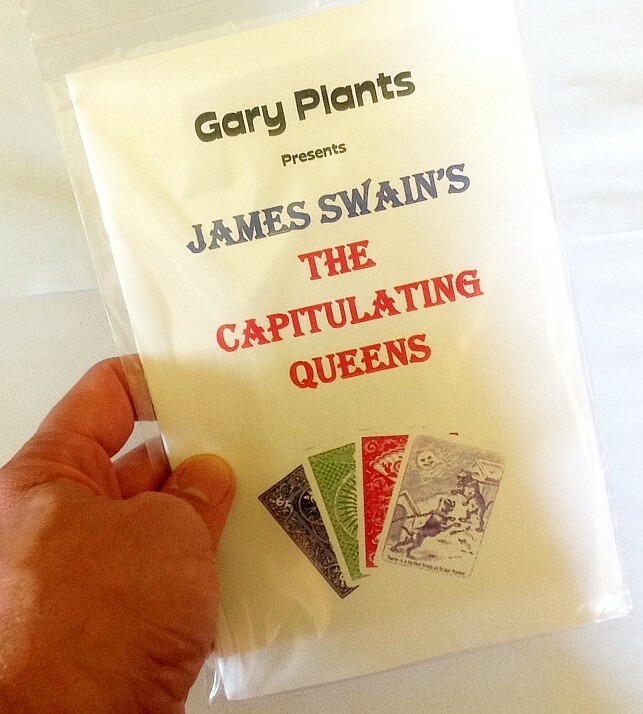 I've been working on the "Capitulating Queens" for a while, and admit I've been enjoying it using no queens…. I use an ace, 2, 3 and 4 or some other small straight-flush. And then just have the backs change in order. Might be missing the point of the free selection idea (I freely admit), but it keeps things clear and easier to follow (at least for me). The re-arranging of the cards - the one to go next - seems to flow well, and the last card (the high one) is the trouble-maker. Swain's tricks are great (wish I could do half of them…his "Homing Card" is another I love, wonderful handling) so I probably should stick to his instructions, but love the effect of the "Capitulating Queens" regardless. Man -- I don't know how many times I've done that --- have a 'packet' sitting here. When I laid it down, it made sense. When I pick it back up (time misdirection) -- who knows! When I got back into magic, I had I think it was 15 packets that were not in envelopes or labelled in any manner. Some were easy because I had taken notes while working on them or otherwise obvious to me for some reason. The last of them took almost a year to resolve the mystery. As for Capitulating Queens -- there's another whole thread about that -- great trick, been doing it since I first read James Swain's book. Went and looked back at his book and video to refresh myself on the method. Seems on the video he calls it 'The Capitulating Cards', but in the book it is 'Capitulating Queens'. Great trick though, and pretty easy to carry and perform. A good stunner. Never saw the Martin Gardner original that it was based on. I just picked this up myself recently, and am looking forward to learn it. Okay, I have an entire deck of cards, the backs are split down the middle length wise, half red/half blue (Bicycle) Half the faces are normal, the rest are split down the middle length wise, Half Queen of hearts, half 7 of clubs I believe. No instructions as the deck was given to me and I was shown what it was and was asked to play around with it. Was a few years ago and now I don't have a clue. Any guesses?